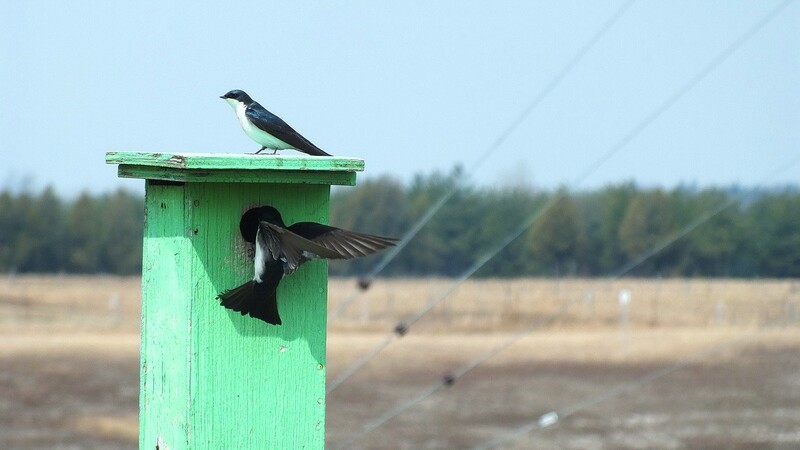 A sure harbinger of spring is the sight of Tree Swallows (Tachycineta bicolor) staking a claim on a chosen birdhouse, and that is exactly what Bob and I witnessed on a spring weekend near Cambridge, Ontario. A farmer had generously provided a small selection of nesting boxes at the edge of a field, and they were a hot commodity. 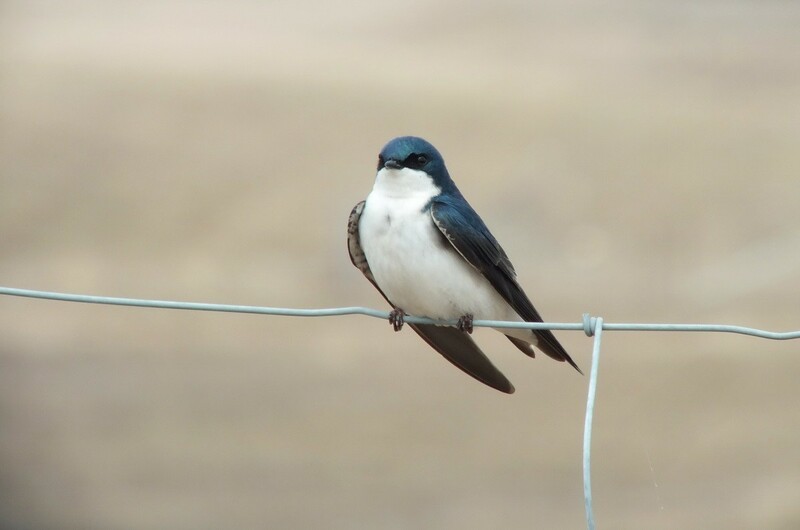 As Bob and I drew up at the side of the dirt road bordering the fenced upland, several Tree Swallows were seen dipping and diving betwixt the birdhouses and low over the brown weathered grass. Momentary rests were taken atop the nesting boxes to demonstrate ownership of the real estate, and other birds vying for the space were chased away. 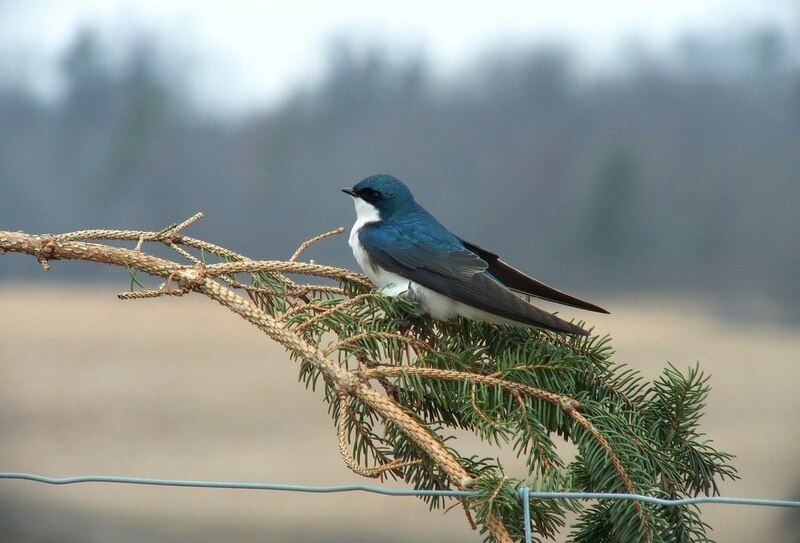 Because Tree Swallows prefer to forage in the air over water or moist ground, they will choose to nest in an area close to either a lake, pond or slough, or a flooded section of land made so by either beavers or man. With Grass Lake a mere 1/4 mile down the side road, the Swallows would find these nesting boxes suitably placed. Tree Swallows will alternately opt for a cavity in a tree as a nesting site, either one left behind by a woodpecker or a natural hollow, and therefore, brackish marshes, wet meadows and bogs, where there is an abundance of standing dead trees near the water, will attract the highest concentrations of these handsome birds because the trees usually are heavily excavated from much woodpecker activity. 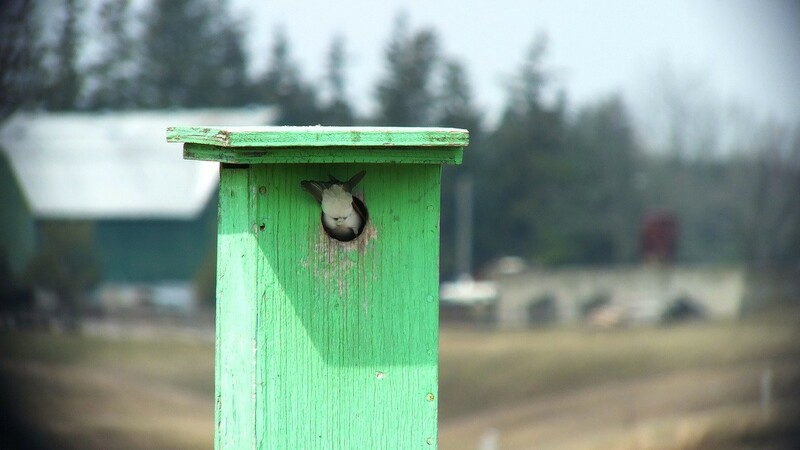 Occasionally, Tree Swallows will occupy nest boxes meant for Wood Ducks, Cliff Swallow burrows, hollow stumps or even holes in the ground. 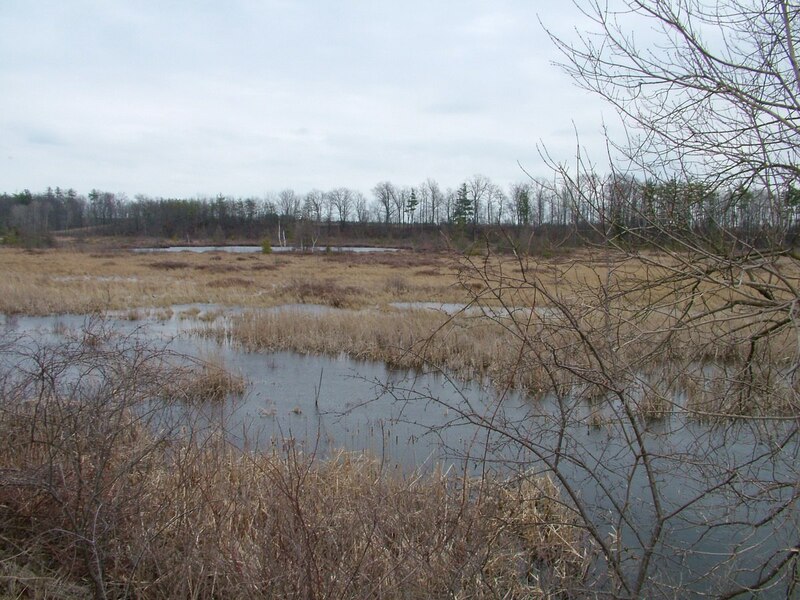 Grass Lake is a marshy body of water with sedges, shrubs and ample stands of bulrushes that will soon fill in with new growth. Around the perimeter of the lake, there is a good selection of deciduous and evergreen trees, so the available nesting boxes makes up for any lack of snags. Tree Swallows are quite attractive birds with glossy steel blue upperparts that show greenish reflections when the sunlight is just right. The afternoon that we visited the area, it was unseasonably warm, a real break from the long, cold winter, but the sun played tag with the clouds and left us under an overcast sky most of the time, so it was difficult to capture the nuances of the delicately shaded plumage. It was difficult for Bob and me to make out the thin black eye mask on the males, but it was possible to see their tiny bills, blackish flight feathers and short, squared tails. Females are more subtly shaded than the males with duller dusky greyish brown upperparts that show more of a green iridescence. Both the male and the female Tree Swallow have snow white underparts. Tree Swallows are small, streamlined songbirds that breed in North America after wintering in the Honduras, Nicaragua and Cuba. They return to their breeding grounds earlier than other swallows, usually around mid-March to early April, so it was no surprise to see them flitting about the trees and getting ready to build their nests. 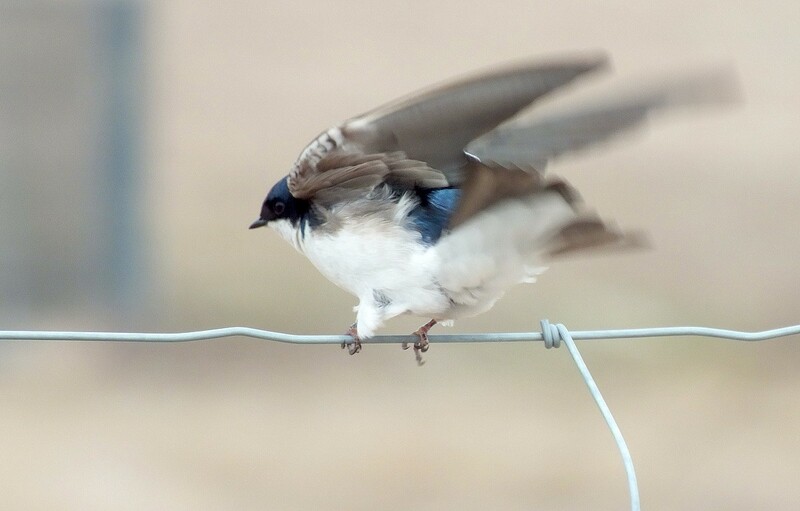 This photograph helps to illustrate the long, pointed wings of a Tree Swallow. Once these Swallows begin building their nest, a collection of pine needles, grass, mosses, rootlets and thin twigs will form the framework, while a selection of other birds’ feathers will be gathered to line the nest and create a soft bed for the eggs. 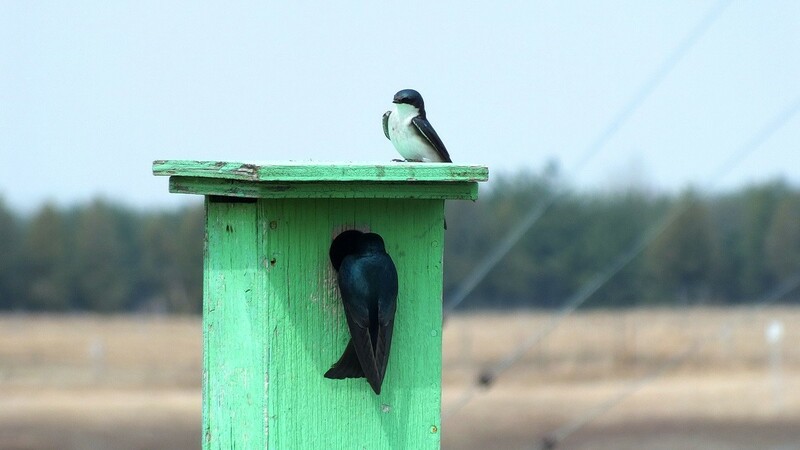 It is the female Tree Swallow that builds the nest, that can take from a few days to two weeks to do so, and she shapes the feathered nest into a cup by pressing her body into the nesting material. At the same time as pairs of Swallows were competing for one of the two nesting boxes on sight, a pair of Eastern Bluebirds also was trying to establish control of one of the boxes. The male Bluebird, seen here on the right, repeatedly flew in and secured his perch on top of one of the birdhouses only to have a Swallow put the run on him. Eastern Bluebirds are cavity nesters too, and where these two species have overlapping ranges, the Tree Swallows and Bluebirds will compete for the cavities or nesting boxes. 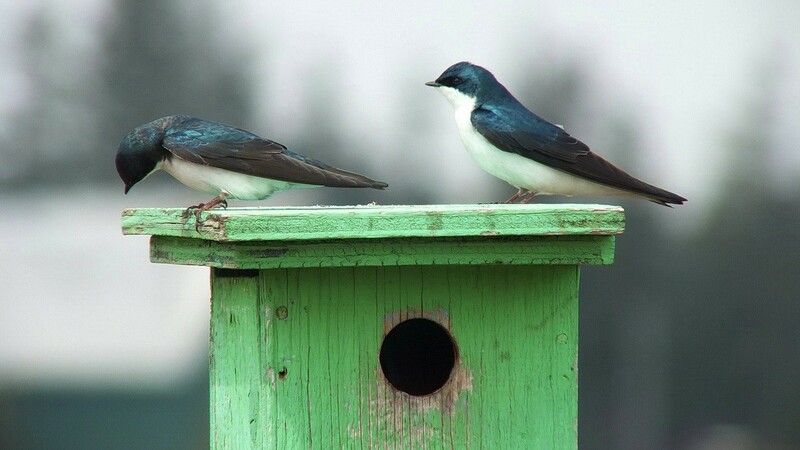 One technique that allows both species to nest together successfully is to “pair” the boxes. That is, to place nest boxes in pairs with the two boxes no more than 5-10 feet apart. 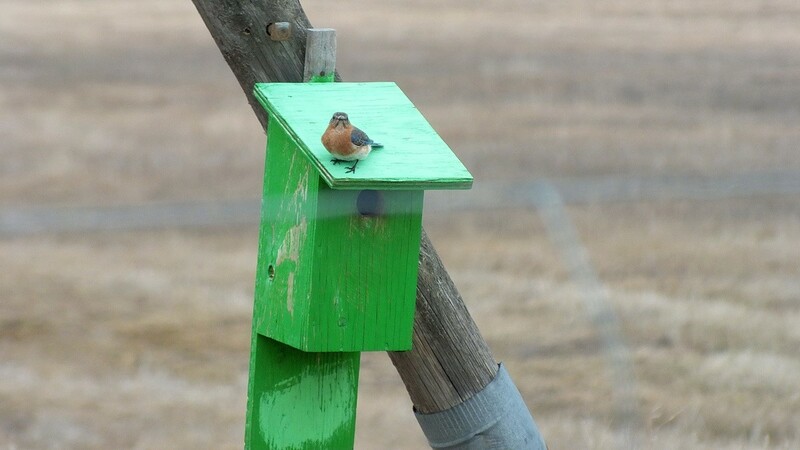 This works because Tree Swallows will not abide another pair of their own species nesting within 10 feet, so after much squabbling, Bluebirds and Swallows will sort out who gets which birdhouse. “Pairs” of nest boxes would be spaced out over 300 feet apart, the distance required between nesting pairs of Bluebirds. 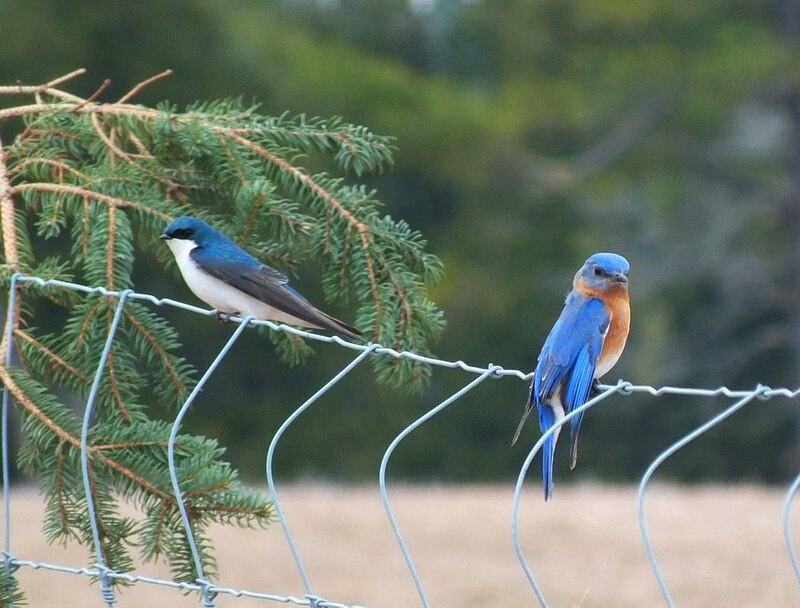 Bob and I altered our position along the wire fence that restricted access to the adjacent hydro corridor, all in an effort to catch the Tree Swallows and Bluebirds in flight, at rest and sparring with one another. This Bluebird paused to scrutinize me as I engaged a fellow birdwatcher in conversation. We meet the nicest people who share our interest in feathered friends and always gain knowledge of one sort or another while passing the time of day. 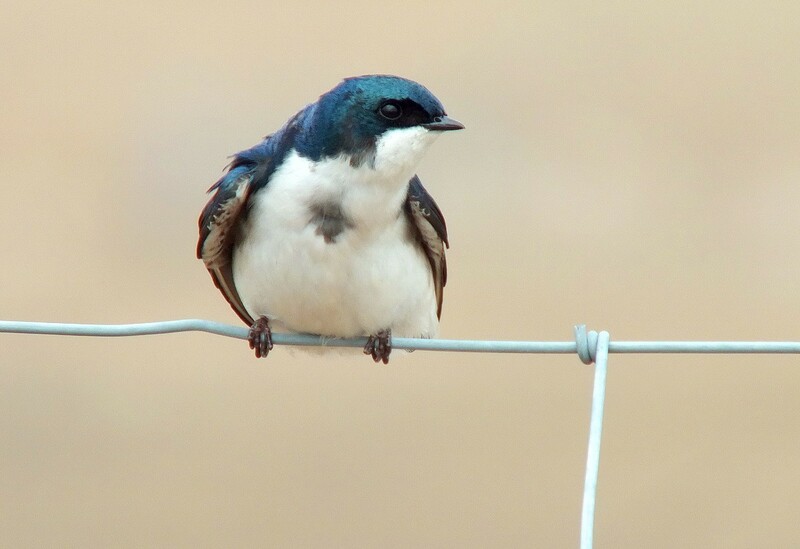 Tree Swallow populations have been decreasing over the past 200 years, but I was pleased to learn that, overall, they remain healthy despite a shortage of natural tree cavities in which to build nests. This is the result of declining numbers of birds that excavate cavities in trees, as well as the loss of natural habitat where dead and dying trees were typically found. Northern forests are cleared, old trees are cut down when woodlands are “managed”, dead trees are removed, while coastal wetlands that make up wintering habitat are drained or alternately lost to rising sea levels caused by global warming. While I patiently waited with my camera propped on a fence post to capture a picture of the Tree Swallows in flight, they eluded my lens with their quick acrobatic maneuvers. They are such skilled fliers that they can actually take a drink or bathe on the fly simply by skimming their bodies against the surface of the water. 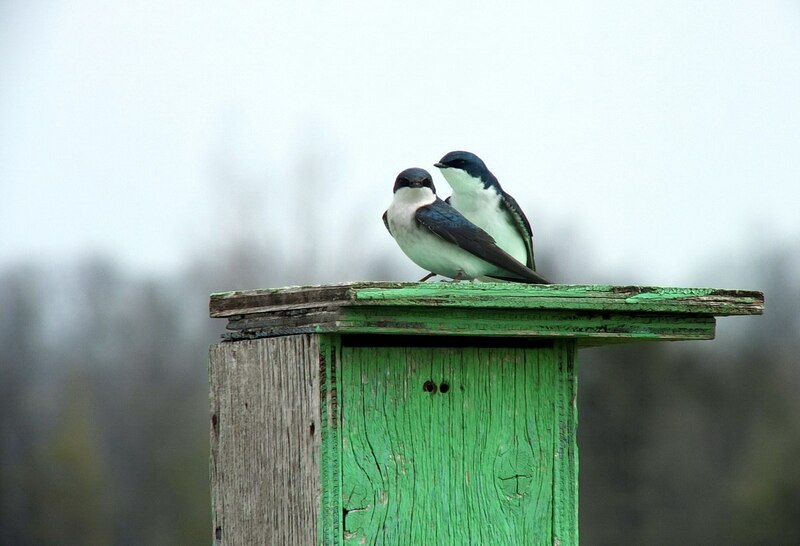 Despite several of us birdwatchers scrutinizing their every move, one pair of Tree Swallows seemed unconcerned and were actively preparing this nest box for habitation. In and out, over and again, the one Swallow entered the birdhouse and exited again shortly thereafter. 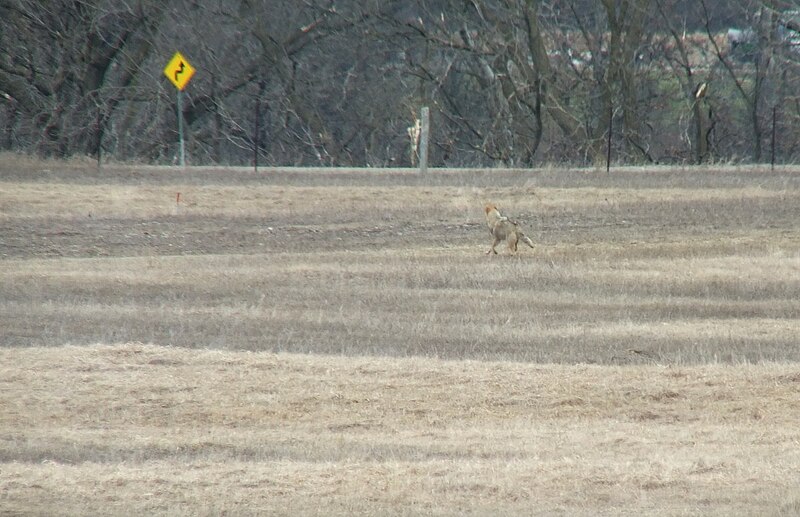 At one point, as Bob stood gazing out over the hydro corridor, he spotted a lone Coyote loping across the distant end of the upland, pretty much in line with Grass Lake. It would pose no threat to the nesting Bluebirds or Tree Swallows, but might, in fact, reduce the number of natural predators such as deer mice, chipmunks and rat snakes that would predate the baby birds. 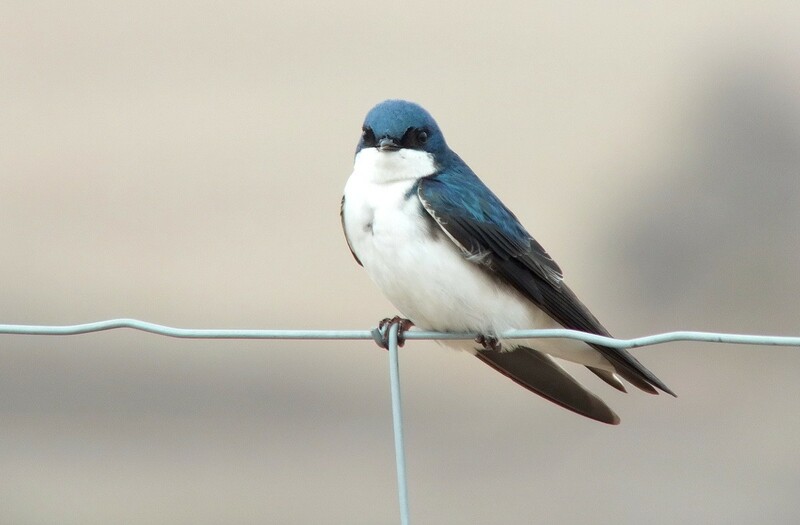 Adult Tree Swallows are vulnerable to predation by Merlins, Peregrine Falcons, Great Horned Owls and Sharp-shinned Hawks. A whole host of other birds poses a threat to the nestlings including Grackles, Crows, Flickers and Kestrels. It is a common thing to see Swallows swooping in formation at predators that pose a threat to their young. 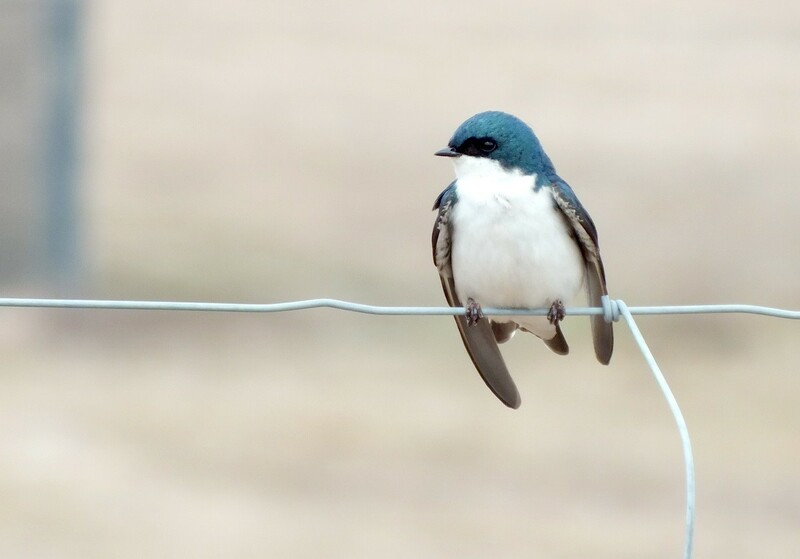 Tree Swallows eat a variety of foods, but insects constitute the bulk of their diet. 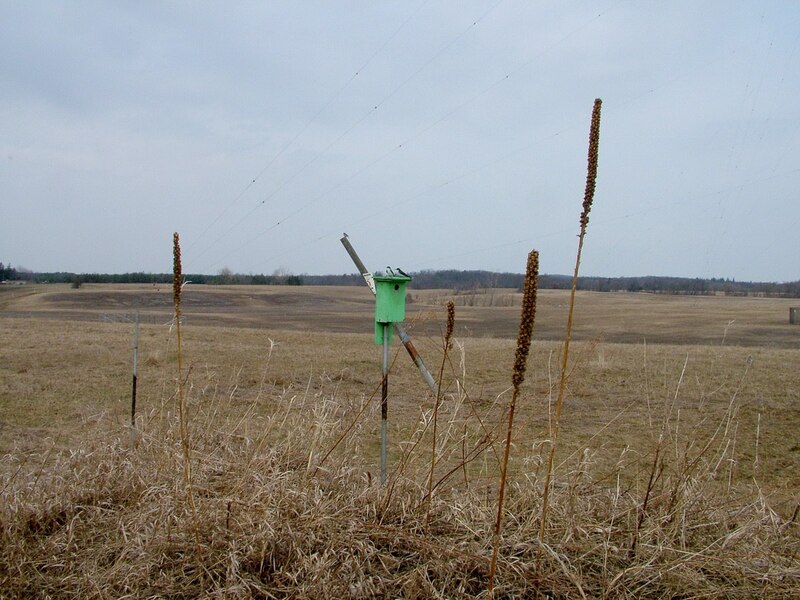 Some plant matter is consumed in early spring when cold wintry weather inhibits the availability of insects. 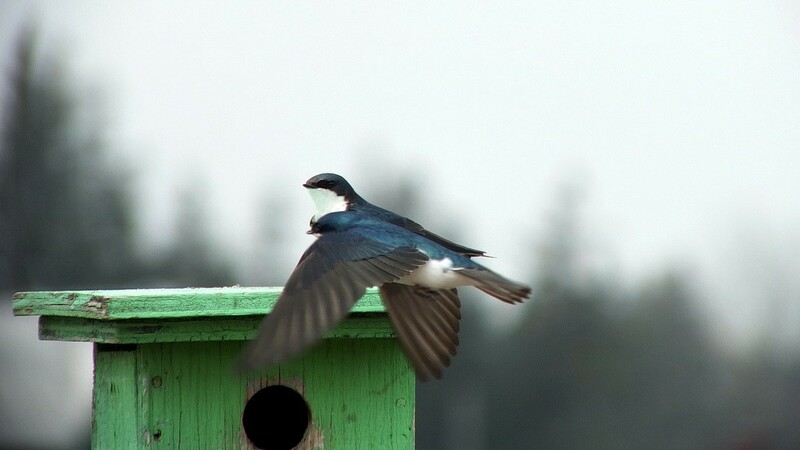 During breeding season, it is important for Tree Swallows to consume higher levels of calcium so they will eat fish bones, clam shells, crayfish exoskeletons and eggshells of loons or gulls. 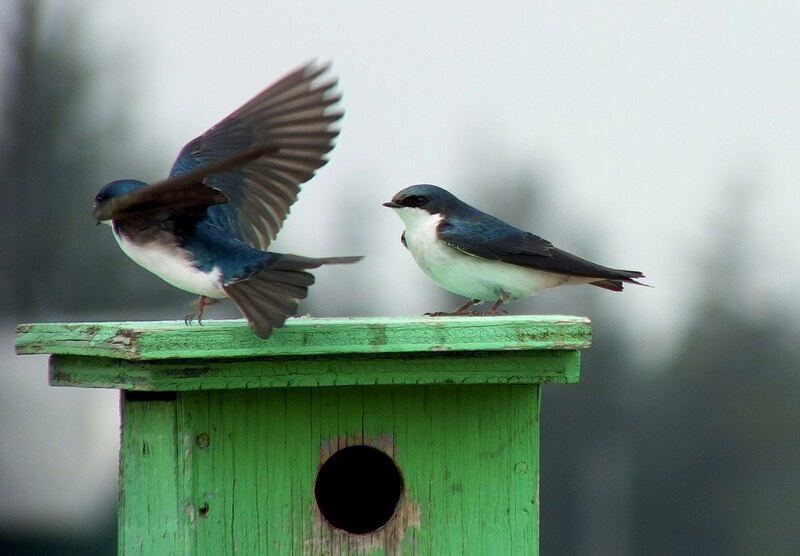 If you happen across an area where Tree Swallows are nesting, and where there is an abundance of flying insects, you will see the birds busily feeding from dawn to dusk. We humans do well by these energetic little birds. Bob and I found it difficult to tear ourselves away from that prime observation point, but we had other areas to investigate while in the vicinity of Cambridge, not the least of which was a stop at Grass Lake to see if we could pinpoint the location of some of the Sandhill Cranes reputed to be nesting there. We left the Tree Swallows to their business knowing that next time we drop by, likely baby birds will fill the nest. 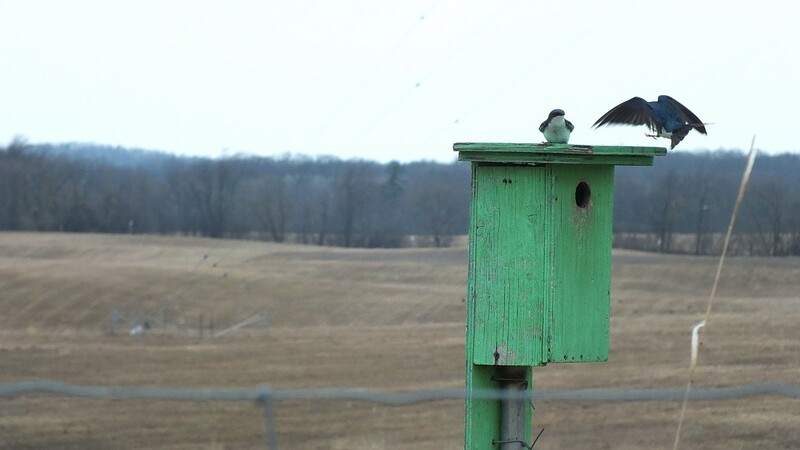 How enjoyable to see the tree swallows at the nesting boxes! I agree. We don’t seem to have any Tree Swallows in our neck of the woods…Scarborough, Ontario…although we often see Barn Swallows in the local park. Tree Swallows are so beautiful with their iridescent blue feathers glinting in the sunshine.